Change Bites by Marissa S. Costonis H.C.
With the new year comes new resolutions. If transforming your health is on your list, this book may be for you. In Change Bites, Marissa S. Costonis H.C. talks about 5 Change Management Strategies to Transform Your Health. This paperback is a step by step guide that teaches us how to change our eating habits and health, no matter what food types we consume. This book will help you transition to a vegan or vegetarian, paleo, gluten free or keto diet properly. The book starts out with an introduction that tells of the author's own struggles with health issues that she faced over the years. She then has us take a look at our own health and how it has effected our lives. She also has us take a personal look at our personal everyday lifestyle and things like sleep patterns, eating styles, relationship etc. All of these things can be effected by our diet habits, so they have to be addressed and acknowledged. Next this book helps us to envision, prepare, plan, commit, own and reinvent ourselves. In these chapters, step by step plans and important and useful information. This book goes way beyond food talk and has a lot of insightful information and teaches us how to change. It is a modern approach that I feel is intended to have long term success instead of a quick fix. I have been enjoying this book and it has made me take a look at myself, my health, and my eating habits in a whole new way. Health change guru Marissa Costonis, Certified Health Coach, has developed the “5 Bites to Health” methodology, which can ease transition to a gluten-free diet. Begin with the end in mind: Be clear on your vision of “perfect” health, why it’s important and what you will do with it once you have achieved it. Assessing your sense of urgency by asking, “why change now?” and focusing on the end result will keep you motivated throughout your transformation. Go slow to go fast: While a few big changes may be helpful in the short-term to jump start your eating habits and health, improving each meal one bite at a time creates sustainable change that will last a lifetime. Focus on the foods you can eat, not the ones you need to give up. Identify your “personal best foods” and all the ways to prepare them. Then, begin to incorporate these foods into a variety of meals and expand your palette from there. Create food flexibility. For example, creating a set of ten simple recipe techniques that incorporate a variety of your personal best veggies gives you the skills and flexibility to make 100 different meals depending on what you have on-hand. Celebrate your successes and look for other ways to use the process over and over to continue making positive changes to your diet and other areas of your life for a true health transformation. This change process can also be used to support a transition to non-toxic beauty and cleaning supplies or pesticides. It can even help in switching up workout routines! 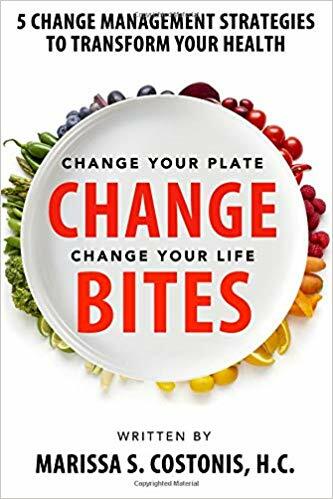 Costonis details how this process can be applied no matter how healthy someone eats today and regardless of how big or small a change they want to make in her new book, Change Bites, 5 Change Management Strategies to Transform Your Health. Marissa Costonis is the health change guru. She is owner of Change Bites, LLC and a Certified Health Coach by Institute for Integrative Nutrition who helps people make easy changes in their eating habits one bite at a time, whether food is the culprit or the cure. She spent over a decade in change management consulting leading a variety of change initiatives around the world. When she developed neuropathy and several health problems began to pile up, Costonis was forced to completely change her diet. Overwhelmed and confused, she began to apply all the leading change models and frameworks to simplify her own health transformation with great success. The “5 Bites to Health” process was born. Today Costonis conducts individual and group coaching programs, workshops and enjoys guest-speaking engagements to share her unique approach and support others in their journey to health. Connect with Marissa Costonis on Facebook @changeonebite, Instagram @changebites, Twitter @change_bites and LinkedIn and visitwww.changebites.com. Disclosure: I received this book to review. This post contains affiliate links.